I keep getting this question over and over, “What books do you recommend for professional women?” Well, here you go! 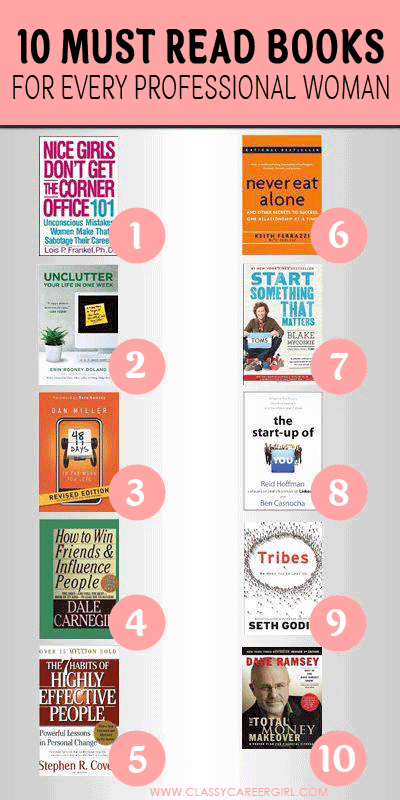 I LOVE reading career and entrepreneurship books and these are my absolute favorites! These are all must read books in my opinion. First, I put together a little PDF of the books that you can download now and take with you to the bookstore or library! What I love about the list below is that each book is a little different and they range from important topics such as finding a job you love, starting a business, networking, getting out of debt and organizing your life. It’s a little bit of everything! Let me know what you read and if you liked it! Updated June 2015: This post was originally published in 2013 so I had to update it to add a few more favorites! Did your favorite book make the list? Did I miss any must reads?